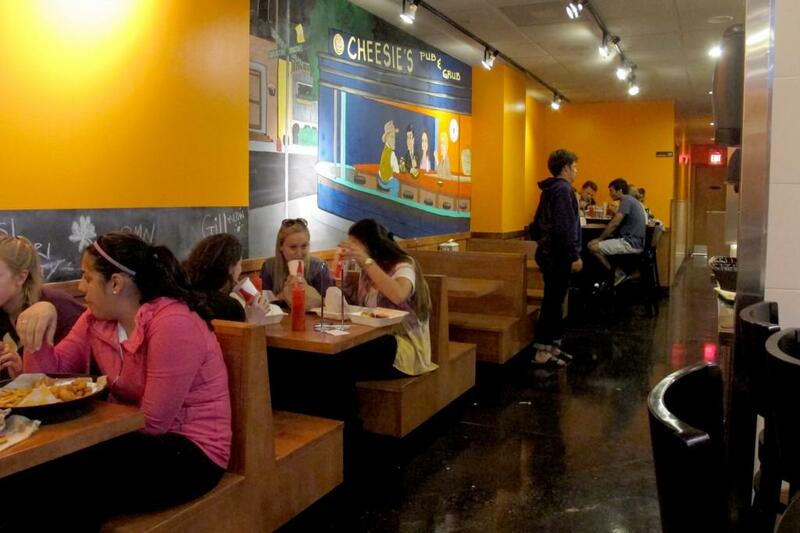 Northwestern students dine at Cheesie’s. The Davis Street restaurant has become a popular spot for students, given the few Evanston restaurants that stay open late. Newly opened Cheesie’s Pub and Grub may start serving alcohol as early as November, adding one more restaurant to Evanston’s limited late-night food and drink options. Buffalo Wild Wings and Burger King were the only two late-night restaurant options near campus before Cheesie’s came to Evanston two weeks ago. The grilled cheese franchise recently opened its second location at 622 Davis St. — the first is located in Chicago’s Lakeview neighborhood — and almost immediately attracted a student following. Evanston Mayor Elizabeth Tisdahl has already approved Cheesie’s liquor license request, and with an additional city council approval, the restaurant will be fully eligible to sell alcohol starting Nov. 1. The restaurant has also obtained permission to serve alcohol at one-day events such as football games so students of age can supplement their gameday experience with a grilled cheese sandwich and a beer. “We want this to be a good place where people come, hang out and feel comfortable,” Kykner said. Evanston does not have strict laws or ordinances that regulate the business hours of restaurants. Only those that serve alcohol must abide by Evanston city ordinances that state businesses are prohibited from selling alcohol between 2 and 9 a.m. for those holding Class A or Class I licenses, and between 1 and 11 a.m. for all the others. Buffalo Wild Wings, which closes at 1 a.m. most days, is another favorite spot for students to hang out, watch sports and devour 50-cent chicken wings on Tuesdays. But Sheridan Foster, manager of the Buffalo Wild Wings at 1741 Maple Ave., said she is not intimated by Cheesie’s entering the late-night market. Foster said Cheesie’s advantage is that it’s closer to campus than Buffalo Wild Wings, but stressed that the two restaurants have very different dynamics and cater to NU students in different ways. For Weinberg sophomore Ogbemi Rewane, “going to B-Dubs” twice a week with friends is a ritual of sorts. Sitting at the same table, his friend from the Public Affairs Residential College, Weinberg sophomore Spencer Schmider said his favorite days to go are 50 cent wings Tuesdays and NFL Sundays. The five students said they knew of Cheesie’s popularity and had tried the new business’s sandwiches, but they didn’t think the added option would interfere with their Buffalo Wild Wings routine. Weinberg freshman Naomi Stevenson said lines are always too long at Cheesie’s, which is disappointing at 2 a.m. on windy nights when she just craves that grilled “mac and cheese” sandwich. “I’m still going to come to B-Dubs,” Stevenson said.